The mission of Care to Learn is to provide immediate funding to meet emergent needs in the areas of health, hunger, and hygiene so every student can be successful in school. The vision of Care to Learn is that all students will have the confidence, self-worth, and resources to maximize their learning potential and become self-sufficient citizens. Care to Learn is based on partnership with school districts and their communities. IDENTIFY students with unmet emergent needs and supplement current services. DEVELOP a sustainable fundraising strategy creating a flexible fund. RESPOND immediately while protecting student confidentiality. Students with unmet health, hunger, and hygiene needs are identified by school district faculty and staff. Anyone from a school bus driver to a principal can report a student need to their school district’s Chapter Liaison to request support through their Care to Learn Chapter. This model allows each Care to Learn Chapter to meet the unique needs of local students in their partner school district. 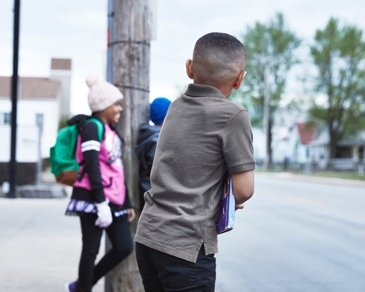 As a flexible fund, student needs can be met quickly and confidentially to ensure unmet health, hunger, and hygiene needs do not stand in the way of student success. In 2008, Care to Learn started finding ways to improve the lives of students in need. With your help, we’ll continue. We continue to thrive thanks to donors and anonymous benefactors who have supported our mission. Our leaders do everything they can to bring more relief to more students. Click here to learn more about Care to Learn's leaders. Writing a story about Care to Learn? Find everything you need from image files to broad historical background.